Some content on this site loads in Flash Player, but will automatically fallback to HTML5 video if Flash Player is not enabled in your settings for this site. 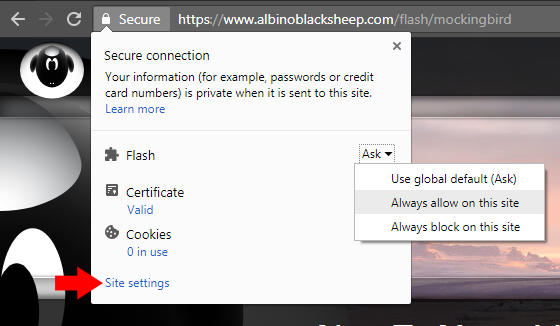 To enable Flash for this site, click beside the address bar to find the link to open Site settings . Default mobile browsers in iOS and Android do not support Flash. These devices will show HTML5 instead of Flash when available. Puffin Browser on mobile has been known to stream Flash. About half the Flash video files have been converted to also run on Mobile. If you'd like to request that one be converted for mobile, please contact with the video's title. The Games have been divided into Flash Games and HTML5 Games, where the HTML5 Games work on both desktop and mobile without requiring Flash.